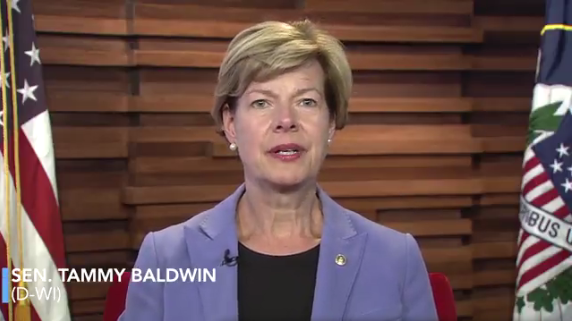 The Weekly Democratic Party Address was delivered by Wisconsin Senator Tammy Baldwin. Last year, when Congressional Republicans tried to pass repeal plans that would allow insurance companies to charge more for preexisting conditions – families across our country fought back. And when they tried to charge older Americans an age tax and make people pay more for less care, you let your voices be heard and sent a loud message to Washington – protect our care. President Trump did not listen and we need you in this fight now more than ever. U.S. Senator Tammy Baldwin (D-WI) delivered the Weekly Democratic Address to highlight the latest health care sabotage by the Trump administration – an expansion of “junk insurance” plans. Senator Baldwin is leading an effort in the Senate to introduce new legislation – in accordance with the Congressional Review Act – to force a vote in the Senate on overturning the Trump administration’s final “junk insurance” plan rule that would eliminate guaranteed protections for people with pre-existing conditions. “Hi, I’m Tammy Baldwin, and I have the honor of working for Wisconsin in the U.S. Senate. The Trump administration is rewriting the rules on guaranteed health care protections that millions of Americans depend on. They are moving forward on an expansion of junk insurance plans that can deny coverage to people with pre-existing conditions and don’t have to cover essential services like prescription drugs, emergency room visits, and maternity care. This is more of the same from Washington and we need your help to stop them. Instead of working in a bipartisan way to take on big drug companies and lower prescription drug costs, Congressional Republicans gave them a huge tax giveaway as they continue to jack up your prices. Instead of working in a bipartisan way to lower health care costs for the middle class, President Trump has been working to sabotage our health system. The Trump administration’s sabotage has made it harder for people to sign up for coverage and created instability in the health care market, contributing to premium spikes in Wisconsin and across the country for 2018. The Trump administration has even gone to court to support a lawsuit that would take away guaranteed health protections and raise costs for Americans with pre-existing conditions. If they succeed, insurance companies will again be able to deny coverage or charge higher premiums for more than 130 million Americans with a pre-existing condition. When I was nine years old, I got sick. Really sick. I was in the hospital for three months. I recovered, but I was branded as a child with a pre-existing health condition and denied coverage. This personal experience has driven my fight to make sure that every American has affordable, quality health care coverage – including the more than two million Wisconsinites with pre-existing conditions. Today, because of the Affordable Care Act, they cannot be discriminated against and denied health care coverage. But now, President Trump’s latest act of sabotage will expand junk insurance plans that could increase costs and reduce access to quality coverage for millions, harm people with pre-existing conditions and force premium increases on older Americans. That’s why I am leading an effort in the U.S. Senate to take action and stop this sabotage. Right now, I am organizing my colleagues to support a new Senate resolution that would force a vote on these junk plans. We cannot let the Trump administration rewrite the rules on the guaranteed protections that families need. If you agree, please make your voices heard in support of my Senate resolution to force a vote on overturning the Trump administration’s expansion of junk insurance plans. Together, we have fought against efforts to repeal health care because no family should be forced to choose between helping a loved one get better or going bankrupt. Congress is in recess and there was no weekly news conference with Democratic House Leadership. “For 83 years, Social Security has stood as the cornerstone of America’s commitment to our nation’s hard-working families and seniors. Whether in retirement, disability or following the loss of a loved one, Social Security has guaranteed that a lifetime of hard-work will be met with dignity, respect and economic security. “Yet Republicans have constantly pushed radical schemes to privatize Social Security and undermine its bedrock guarantees. Today, the financial security and well-being of millions of Americans are again under dire threat from the Republican Congress and Trump Administration’s brazen special interest agenda. Republicans exploded the deficit with their $2 trillion unpaid-for giveaways to the wealthiest 1 percent and big corporations, and are now using the deficit to attack Medicare, Medicaid and Social Security. If successful, their brutal budgets and constant attacks on people with pre-existing conditions would cruelly rob hard-working Americans of their health, their dignity and their rights. “Today we celebrate six years since the DACA initiative was finally implemented, giving thousands of patriotic, courageous young men and women the opportunity to use their skills and dreams to strengthen and enrich our communities and our country. These talented young people embody our nation’s most sacred values of equality and opportunity, and through their hard-work and determination, make America more American. “Yet, the Trump Administration and Congressional Republicans continue to double down on their hateful, discriminatory, anti-immigrant agenda that terrorizes communities, condemns vulnerable women and children and tears families apart. Instead of listening to the will of the American people who overwhelmingly support DREAMers, the GOP is using these hard-working students, teachers, servicemembers and entrepreneurs as partisan political pawns in their reprehensible attack on our nation’s values. Women weren't "given" the right to vote. We fought, marched, and organized for the #19thAmendment. Thanks for this, Jan. The thought of losing Social and Medicare makes me quake. I’m already upset over the thought that millions who thought they had health care will have it taken away. Nothing is certain but this Wednesday morning it seems that the rule of law still prevails. Let’s hope we can take back the House.